Since early June my roommate and I have been pounding the pavement four or five days each week in our quest to train for Boston’s half marathon on October 9. Before long the sight of long stretches of asphalt, gravel and the same scenery became tiresome, and I needed something to help keep my mind off the drudgery of putting one sneakered foot in front of one another. People with walkmans (and gigantic portable stereos before them) long ago discovered portable music’s ability to make a multitude of tasks seem easier. Now that I’m a proud iPod owner, I’ve found that the secret to exercise success is partially linked to the right case. After a snafu in which Apple mailed me the wrong case to go with my new ‘pod, I stopped by my neighborhood Apple store one night just as they were closing and quickly grabbed what looked like a good case – XtremeMac’s SportWrap for iPod. Open the box and you’ll find a good-sized case made of neoprene with a pocket fronted by a piece of clear plastic covering the iPod. The SportWrap comes with a long 12.5-inch Velcro strap to go around your arm, so open the case’s rear panel, place the ‘pod face down in the pocket, shut the panel and you’re almost ready to go. Both the top and bottom of the case contain small holes for your headphones. XtremeMac calls these holes “self-sealing,” which conjures mental pictures of a space-age fabric capable of detecting moisture and moving to prevent it from getting through. In reality, it means that these openings are made of two layers of neoprene. Each has a single hole that’s imperfectly aligned with the one next to it, meaning some fumbling can be required to push a headphone plug through the holes and into the iPod jack. If it’s difficult to push a headphone plug into the iPod, nothing short of a good splash of liquid is likely to make its way through, especially if a headphone plug is filling that hole. Because of ample amounts of soft neoprene (and a large rear panel made of a single piece of the fabric), the case is relatively comfortable. Devices like this one (which are worn very close to the skin) are often poorly designed because engineers don’t account for the fact that certain bands of stitching or funky straps can rub against the skin and cause irritation. Thankfully, the SportWrap doesn’t seem to have any of these problems. With a nice long Velcro strap, it easily fastens to your arm. Having used it while running and biking, it has no problems staying with you while you move. While likely suitable for most people, those with very large biceps (>15 inches) might think twice about using the SportWrap. 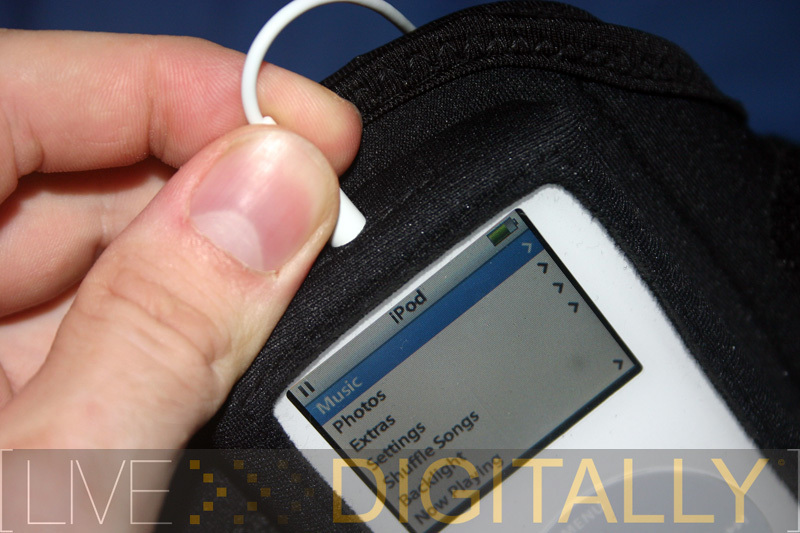 The clear plastic panel covering the iPod’s face keeps sweaty, dirty fingers safely away while not limiting your ability to use the scroll wheel and view the screen. I’ve used the case while exercising a dozen times or so at the time of this article, nearly all while exercising, and during all of those times sweat has yet to penetrate the back of the case. HOWEVER, in honor of LD’s affection for giving stuff we review here a bit of a challenge, I decided to see how the SportWrap would handle a bit more water than most people might throw at it. After letting the rear flap of the case sit under running water for a few seconds (repelled without any apparent difficulty), I let it sit for 10 minutes with approximately two tablespoons of water on the backside, to see if they could make it through to the plastic beneath. Since a watched pot never boils, I left the SportWrap alone…upon my return I noticed that the neoprene managed to absorb all the water, without leaving the faintest trace of moisture on the plastic beneath. The verdict? Don’t swim with this thing on, but feel free to do just about anything else where you might get sweaty or even rained (lightly) on. One of the biggest potential complaints likely to surface about the SportWrap is its size. Approximately 5.25 inches tall and 5.75 inches wide when on your arm, subtlety is out of the question. While this doesn’t bother me, there are people out there who are always looking for smaller, more discrete cases. Conversely, most people don’t go out of their way to make a fashion statement while exercising; I believe the SportWrap’s need for superior functionality supersedes the need for a smaller form factor. My biggest problem with the SportWrap is its space for holding headphone slack. 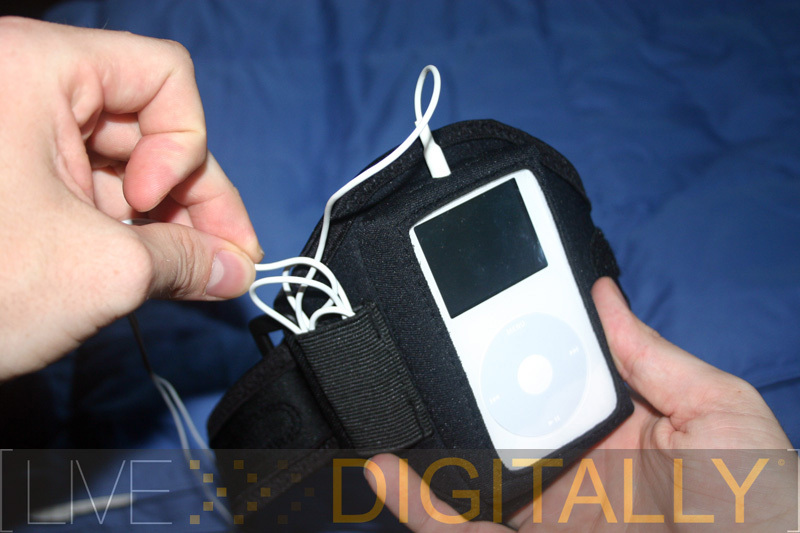 A rectangular piece of elastic is stitched to the case on one side of the iPod pocket forming a tube in which a person is supposed to stuff the excess cord. When running, my experience has been that the slack on standard headphones/earbuds is best left hanging free, because your arms and head are moving and trying to find the perfect amount of slack to put away can be a problem. While riding a bicycle, however, your arms are in a fixed position and slack has the potential to be a bigger problem; a few times my earbuds came out of my ears and nearly hit the ground or got caught in my tires. I’ve also used the SportWrap when going around town – subtlety is not a factor here, as the only way you’ll get away with the SportWrap as a non-exercise case is by attaching it to something, like a backpack. Carrying it around with nothing else in your hands is basically an open invitation to mockery. Sad, but true. iLounge recently reviewed XtremeMac’s SportWrap iPod shuffle, giving it props for its ability to protect the player and its availability in different colors. Conversely, they say it isn’t as comfortable as other armbands, is a bit bulky and doesn’t have the best headphone jack hole design. For a player as small as the shuffle, I’ll agree with iLounge’s conclusion about the bulkiness of a SportWrap; something that small begs for a case designed to minimize its presence. The site’s review does, however, fault the case’s aesthetics, a conclusion I believe to be purely subjective. a. 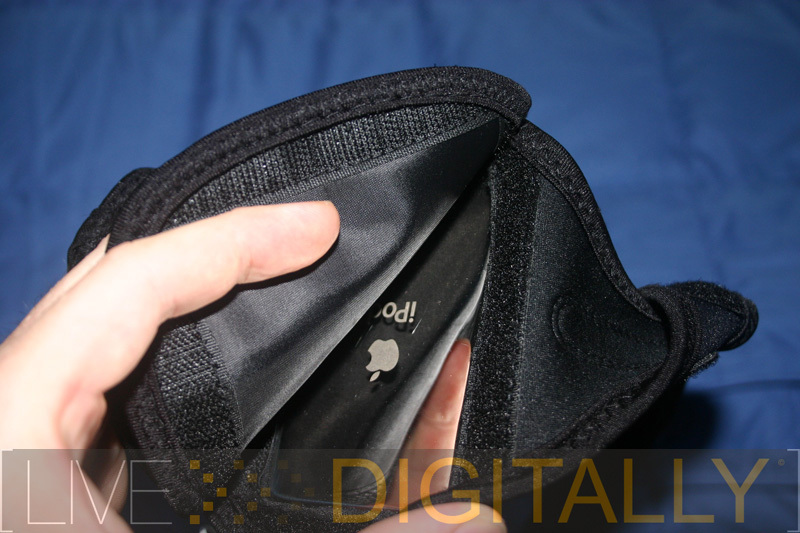 )A single large neoprene rear panel reinforced with nylon and ample Velcro ensures a good barrier against liquid. b.) The front panel is clear plastic without any holes – sweaty fingers won’t get your player grimy while still being able to manipulate the iPod’s scroll wheel/buttons. II. Extra cord storage is awkward – the only way a person can apparently get the slack to go inside this space is by pushing it in with a finger. This could be solved differently (i.e. velcro), but that would lead to an inability to easily access slack without opening said strap. This is an area needing design improvements. I. BIG – approximately 5.25 inches tall and 5.75 inches wide when strapped to your arm, this case is anything but slim. II. Headphone port – made with a “self-sealing” design means the jack doesn’t slip right in…you need to feel your way there sometimes. Conversely, it’s designed to keep moisture out, which it seems very capable of doing, especially when a headphone plug is filling the hole. Highly recommended. Solid construction lets it go anywhere but the pool.